Editors: Rosamund Kidman Cox, David Helton, Wendy Smith, and Helen Odams. Additional Contributors: Alison Jolly, Mark Pidgeon, Liz Bomford, and Tony Bomford. BBC Publications / Wildlife Publications (1984). 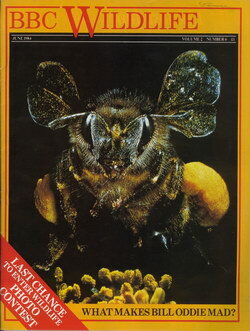 This issue of "BBC Wildlife" contains an article about the lemurs of Madagascar written by Alison Jolly. The five-page article (pp. 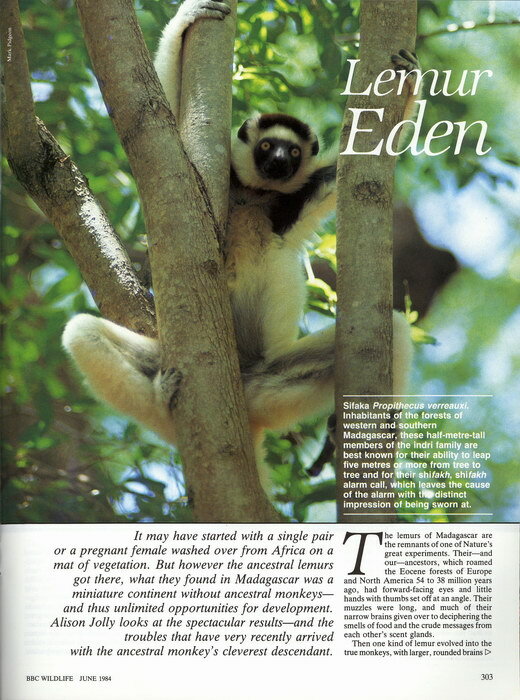 303-307) is entitled "Lemur Eden" and includes four colour photographs of lemurs. It may have started with a single pair or a pregnant female washed over from Africa on a mat of vegetation. But however the ancestral lemurs got there, what they found in Madagascar was a miniature continent without ancestral monkeys � and thus unlimited opportunities for development. Alison Jolly looks at the spectacular results � and the troubles that have very recently arrived with the ancestral monkey's cleverest descendant. Very Good. Subscriber name "Stouse" written lightly in ink on the cover.